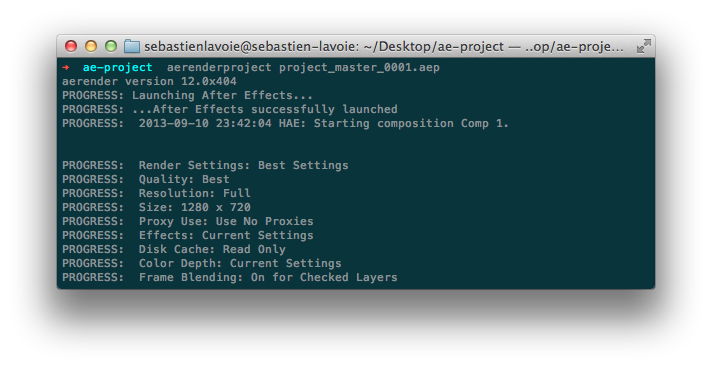 Adobe provides us some command line interface to start renders without having to start After Effects (here’s the documentation). This can be really useful when using multiple computers on remote desktops or just to give you the ability to alt+tab, start your render and keep on working. It offers a lot of options and possibilities. We won’t go over all of them, but we’ll instead focus on creating bash aliases to execute what we would probably mostly want. Don’t worry if you’ve never used the command line, we’ll go over all there is to know.